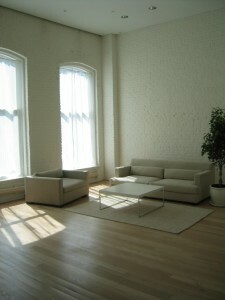 Light colors make a room look larger and can also make a room with few windows look brighter. In addition, dust will not show up as much as it does on a darker floor. Dark hardwood floors can be refinished into a lighter, or even a white, color. White wood floor stain is available. This stain gives a white hue but still allows the wood grain to show through. Oil based paint in different shades of white can also be purchased and diluted with mineral oil. When applied, the floors will appear stained, however, the wood grain will still show through. White paint can be purchased in bone white, linen white, and many other white or very light colors. A non-yellowing latex urethane must be applied after staining or painting to protect the finish. Another procedure to give a hardwood floor a light look is to rub a white pickling stain into the floor. This leaves the floor coloring with a white washed look. For example, red oak will take on a pink hue but the oak wood grain will show through. If a pure white is color is wanted, wood bleach is available and can be applied before using the white pickling stain. This removes the natural color variations in the wood. Once completed, a protective coating will need to be applied to protect the floor. Before beginning any whitening procedure, the hardwood floor must be sanded down to the wood to remove any stain, paint, and rough spots in the floor. Once that is done, one of the above procedures can be done or the floor can simply be covered with a minimum of two coats of polyurethane. There are several different types of polyurethane available including an oil based and a latex. An oil based polyurethane is amber colored and, when applied, will give the floor a light golden look. A latex polyurethane will give the floor a light beige or blondish color. Polyurethane is available in gloss, semi-gloss, and satin sheens. The choice will depend on the type of finished look that is desired. Light wood stains can also be purchased. These are available in a variety of colors including natural, golden pecan, and cherry. These stains bring out the wood grain of the flooring for a beautiful, natural wood look. Once applied, the stains must be covered with a polyurethane or other coating of that type to protect the floor.